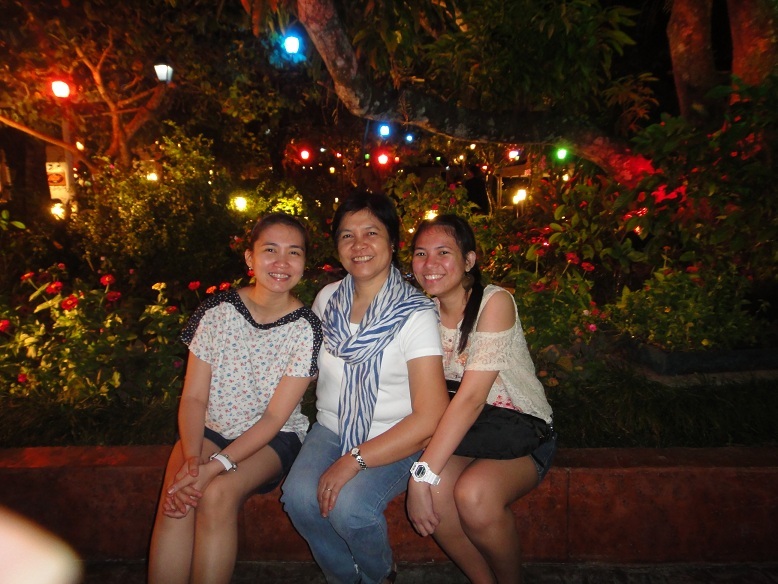 We finally spent the weekend with my aunt and uncle in Cavite earlier this March. I designed their cute and cozy house and I finally got the chance to experience it for a whole day. May I just say erm.. brag a little that it is well ventilated and I think I can spend the night without using active air conditioning. We scheduled for this trip not less than seven times already since November, but because of numerous reasons I cannot recall, it was only last weekend when it finally happened. Me: Henry pupunta kami kay tiya this weekend ha? Henry: Sige, di naman yan matutuloy eh..
And when we were on our way there he texted. 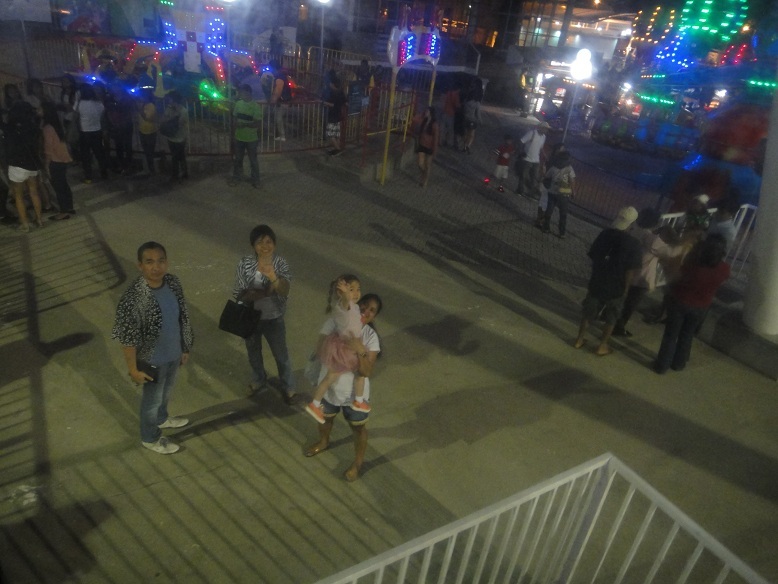 “Mukhang natuloy nga kayo ah :(” too bad he had something to do that Saturday so he wasn’t able to come with us. My Aunt also texted me “Saan na kayo?”. I decided to call and say “Tiya, ngayon ba yon?” I heard her exasperated breath before saying “Di ba ngayon yon?” in her most masungit voice. I did not prolong her agony and said “Hindi tiya loko lang, andito na kami sa may Talaba III”. She said she felt blood pressure elevate because her boiled meat is already tender! When we arrived her bulalo did not disappoint! 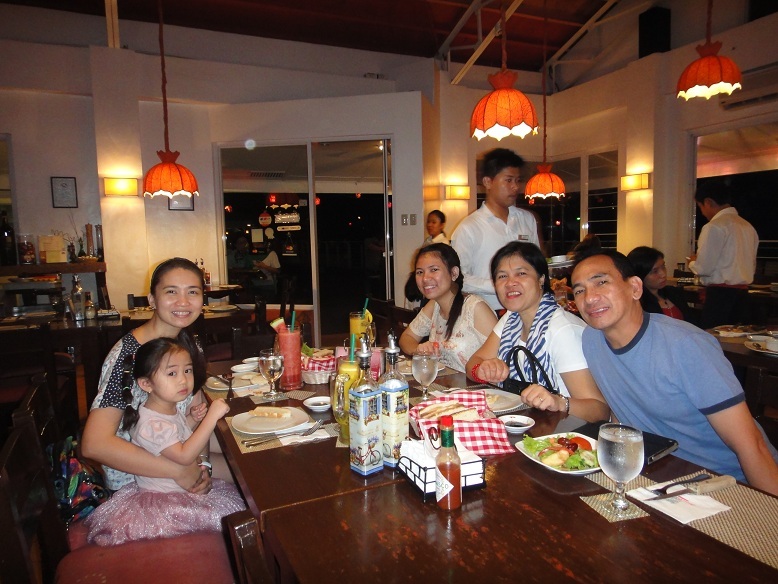 We were so full that all I did was lie and watched the princess diaries (suggested by Ate Denise for princess Iya). 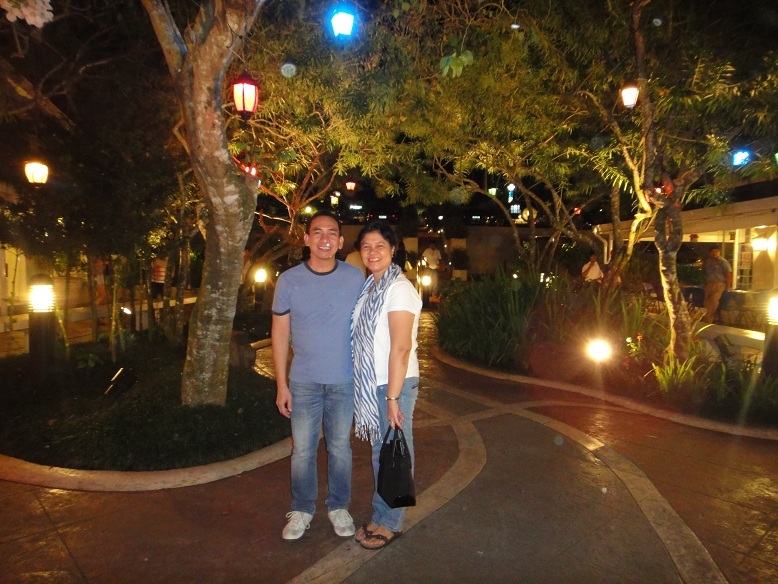 After much lounging around we freshened up and went to eat dinner in Tagaytay. It was a long time since I have been there and it was Iya’s first time so I bought a sweater and pants anticipating the cold weather. But Denise’s friend said it was not that cold so I changed to shorts and shirt to not look too wrapped up. I instantly missed my bulky sweater when we went to the sky ranch. It was so windy that my nails were shades of violet. It reminded me of my first time in HK when I asked Henry to check the weather but he said it’s just like Manila. When we got there we were the only ones without a jacket and were wearing spring colors in the sea of black. 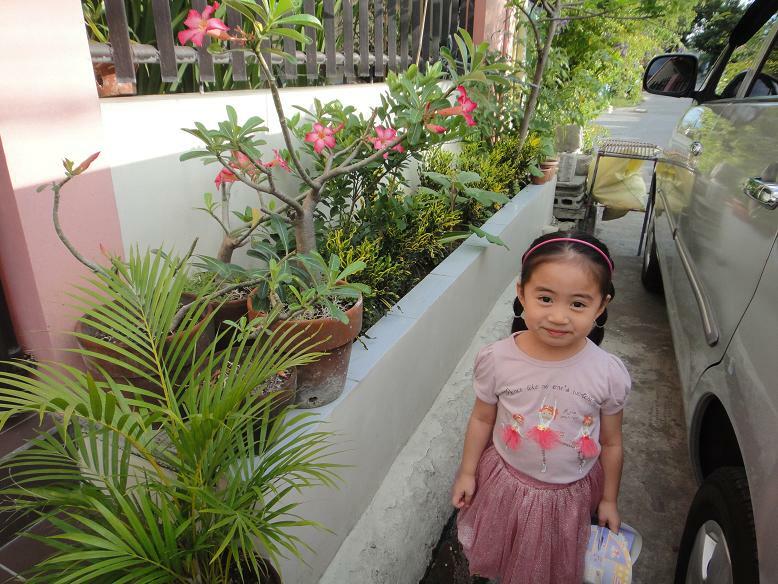 Iya in front of my Tiya’s house before heading off to Tagaytay. She had her teapot paper bag with her princess toys with her. Unfortunately I forgot to take pictures of the house..
We had dinner in “Buon Giorno!” a fancy Italian restaurant in a plaza overlooking the Taal Volcano. 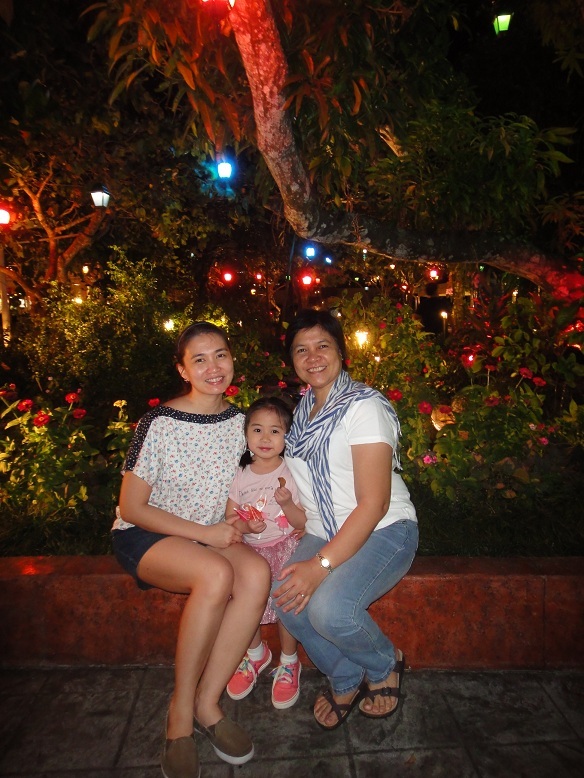 Iya instantly posed with the pink flowers and kept on going out to enjoy the lights and the landscaping. It was also the perfect opportunity to take pictures before and after eating. 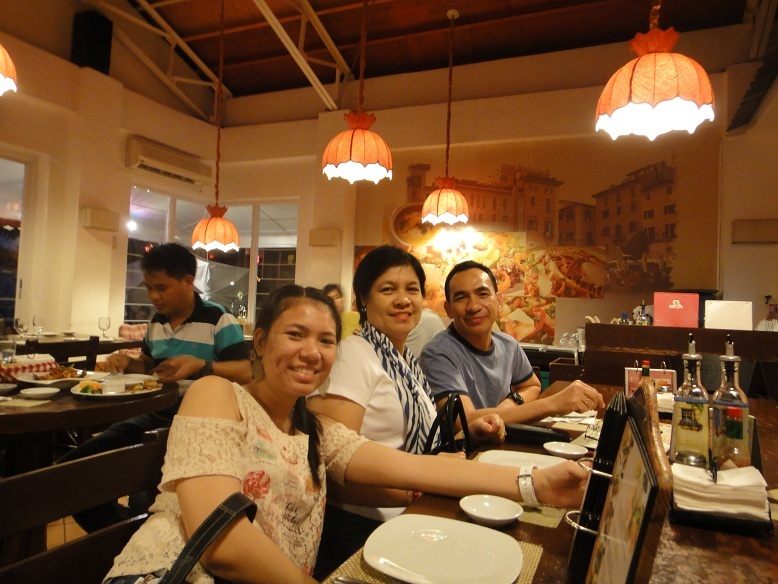 Tiya and her family usually eat here whenever they attend Sunday Mass in Caleruega. They shared this experience with us. 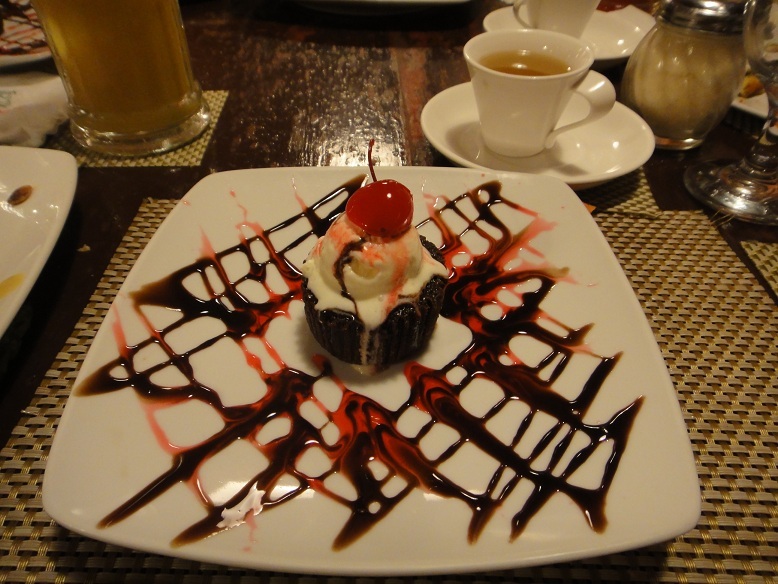 It was truly enjoyable because of the view and the delicious Italian food. 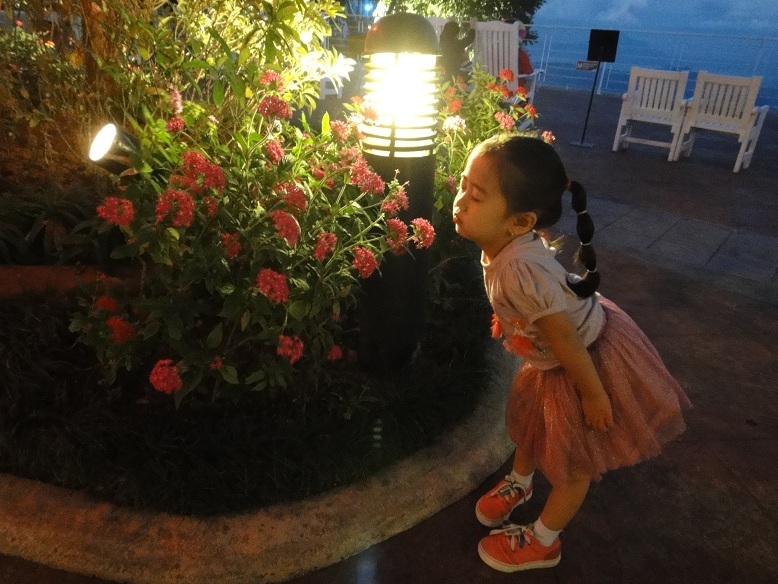 Iya smelling the pink flowers. 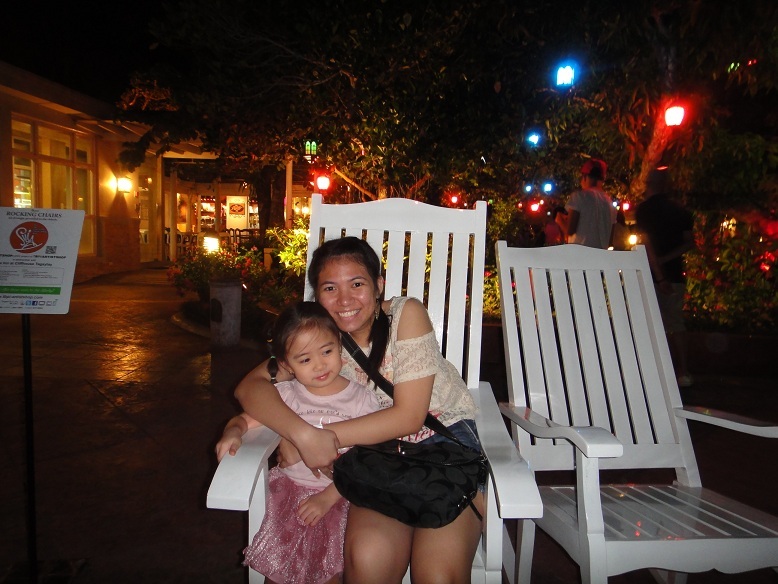 Photo Op with the country style rocking chairs facing the Taal Volcano. 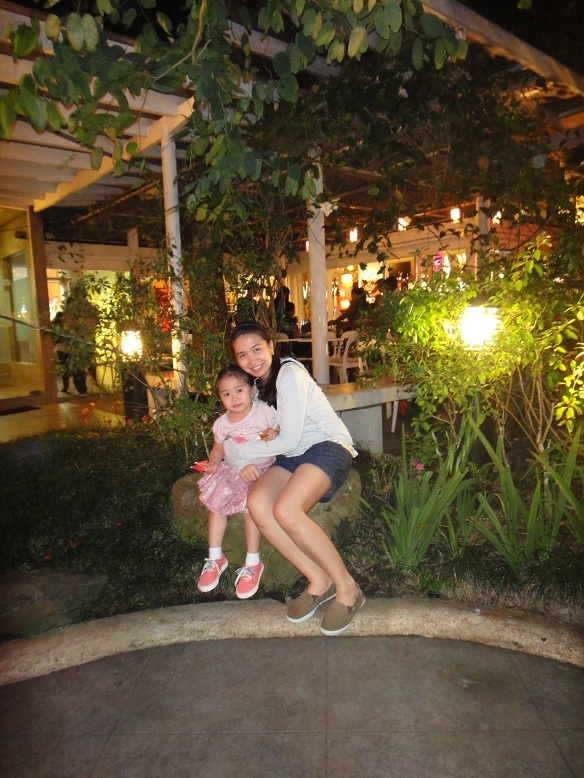 With my Tiya. She’s the one who took care of me during the time my mother was still working. She also became my second mom and therefore never runs out of embarrassing stories from my childhood. Enjoying the park in the middle of the restaurants. I had the salmon meal and Iya had the usual chicken fingers but I kept sneaking her asparagus. The waiters sang the birthday song for Tiya and she blew the candle in her birthday panacotta. 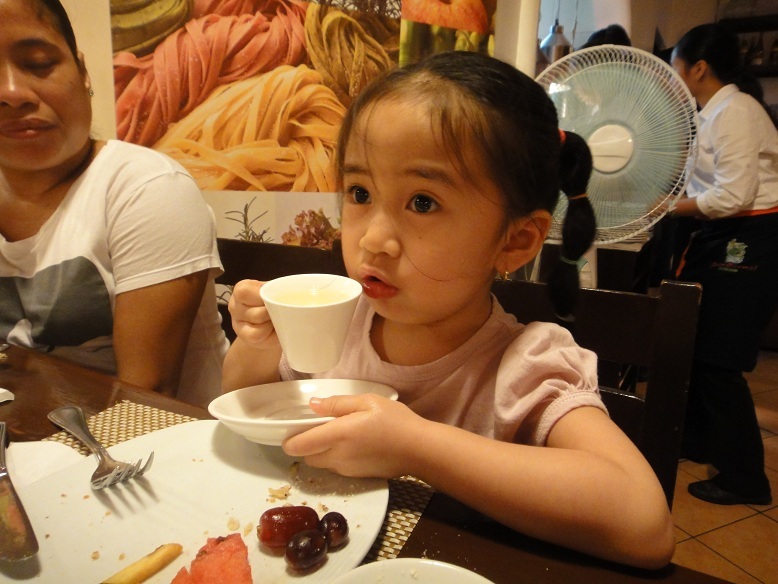 Iya wanted to do that too so the waiter lit the candle again and made Iya blow it for the second time. Our hungry group ready to eat! 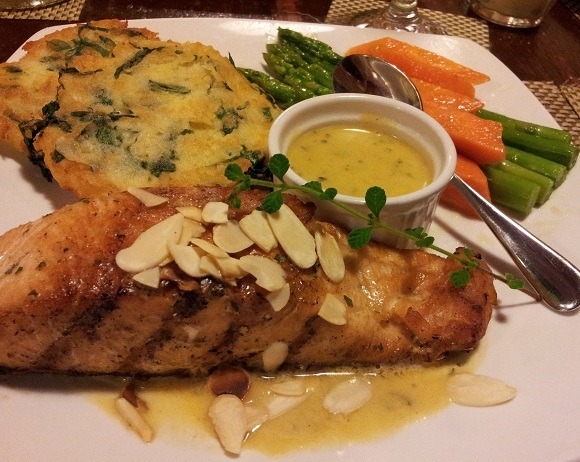 My yummy salmon with almond slivers and potato cake. Yum! Tea after the meal. 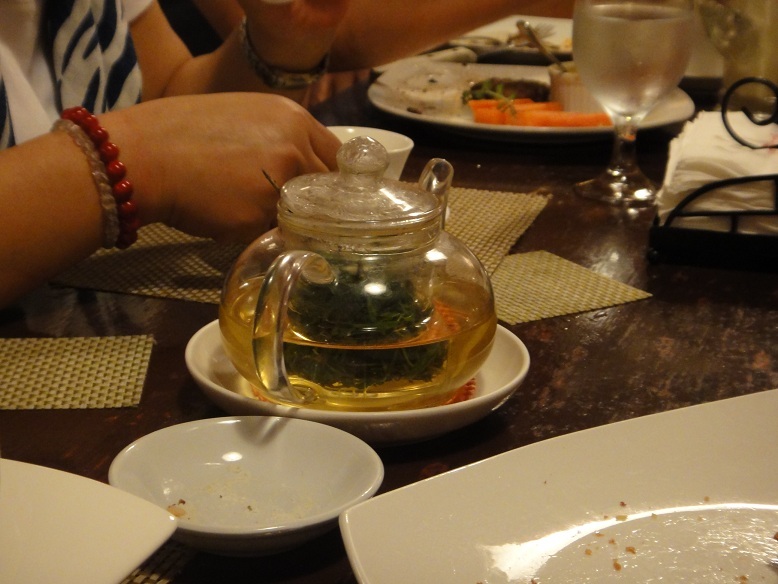 Mint and Jasmine tea I think..
Iya, not to be outdone, also drank tea. 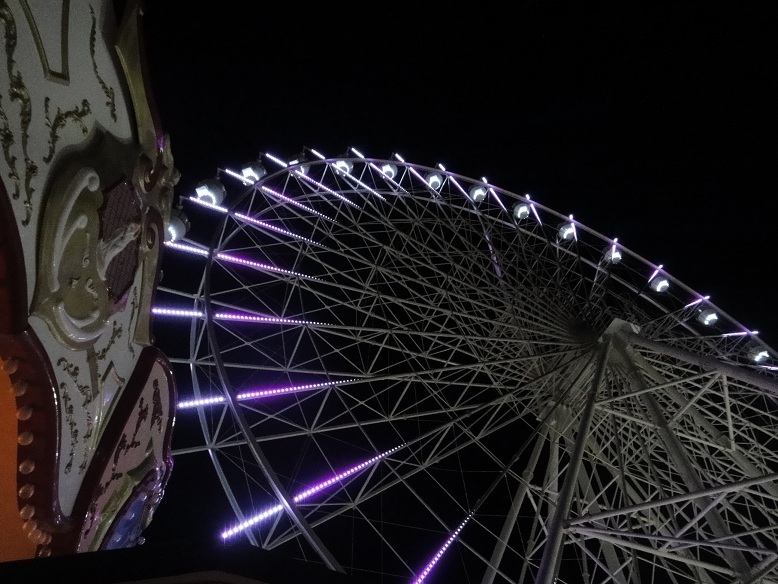 After dinner, they took us to the newly opened Sky Ranch were Iya rode the train while Denise and I tried the roller coaster and the huge ferris wheel. I am such a chicken when it comes to these things. 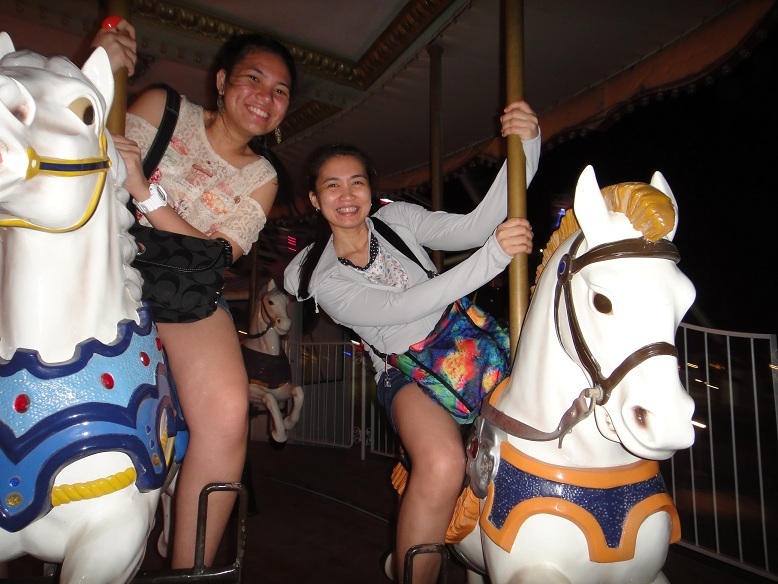 We also rode the carousel which was by far the best one there. 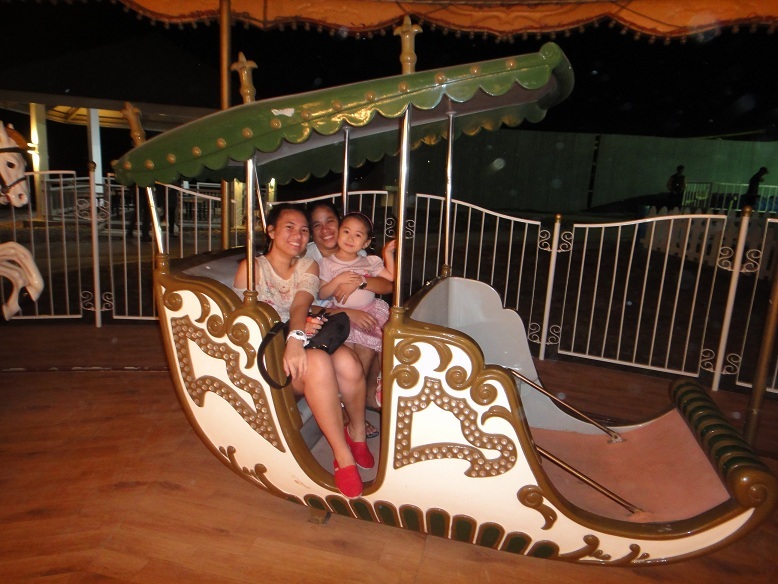 I had a nice view of Iya riding the carriage in front. 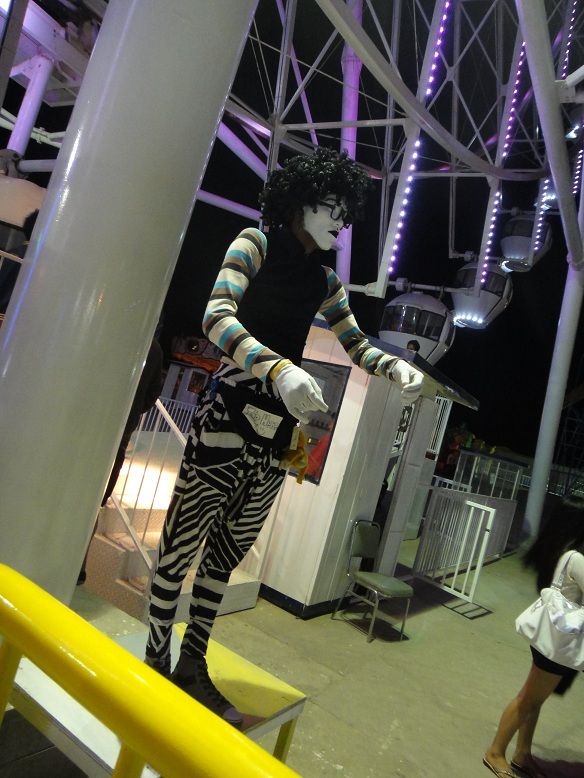 The sky ranch was expensive because you have to pay for each ride. 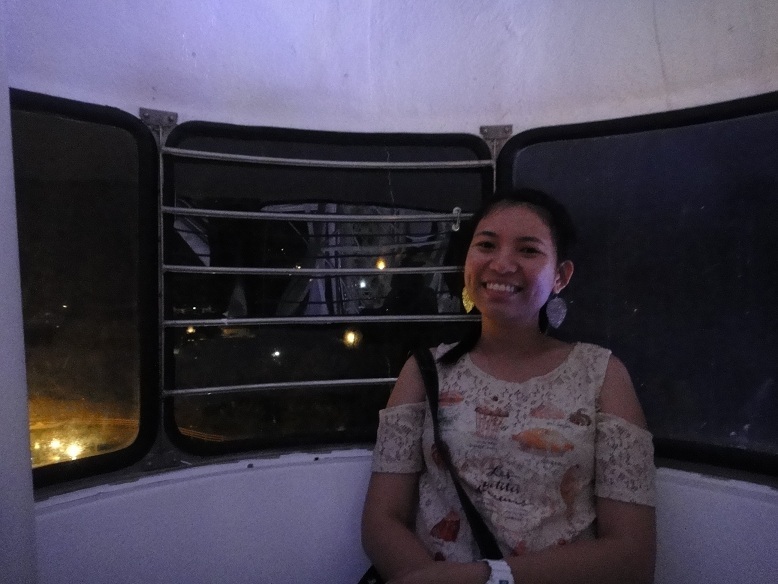 My crazy ferris wheel mate who kept on reminding me of the possibility that the cables may break and then we plummet to our death. 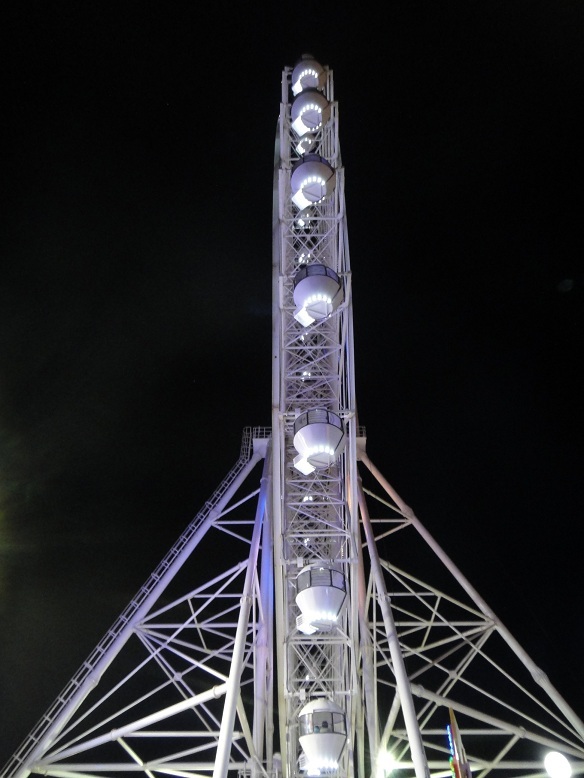 Luckily I watched the Discovery Channel feature years ago about theme park rides and how they design it. The steel members are actually over designed and can carry weight way heavier that the actual load. While we were waiting in line I got the chance to inspect the members and the joints and because it’s new there really is nothing to fear. I just have this irrational fear of heights. The night was so cold! It pierced through my bones! I was amazed how and why Iya can take it when she was only wearing her pink tutu and tshirt. I knew the answer when Tiya told me that she offered her shawl (in Tiger blue stripes) but she said “Di pwede kasi hindi bagay (in relation to her clothes)” What? She knows Tiis Ganda already?! 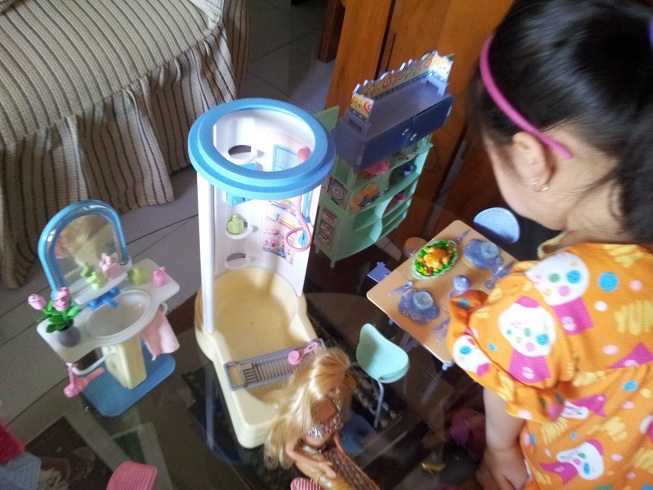 The following day after eating breakfast, Iya played with ate Denise’s barbies while I watched Crazy, Stupid Love or something that showcases Ryan Gosling’s abs. 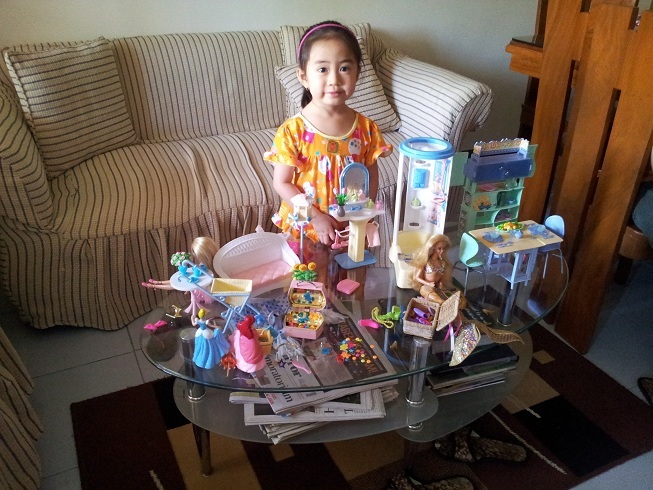 Both Iya and Denise were enjoying setting up the little things and trying to dress the dolls. At one point she said to her ate “Ate Denise, pakilagyan nga ng t-shirt si barbie” because barbie was wearing a mermaid brassier. She’s so conservative! I wonder where she got that from… I had a difficult time convincing Iya to stop playing. 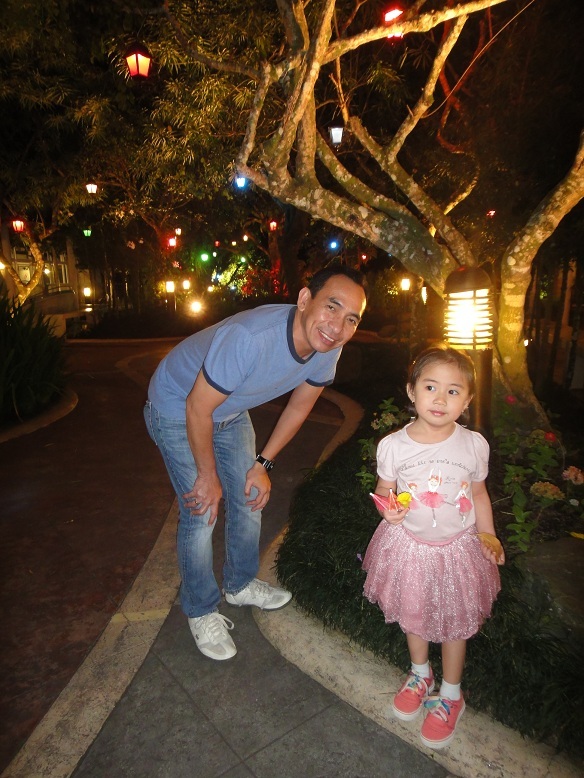 Even if we want to extend our stay, we still have to attend the birthday party of my friend’s daughter that afternoon. Si barbie na naka bra. They dropped us in the Mall of Asia to wait for Henry to pick us up. It was too bad he missed all the fun! 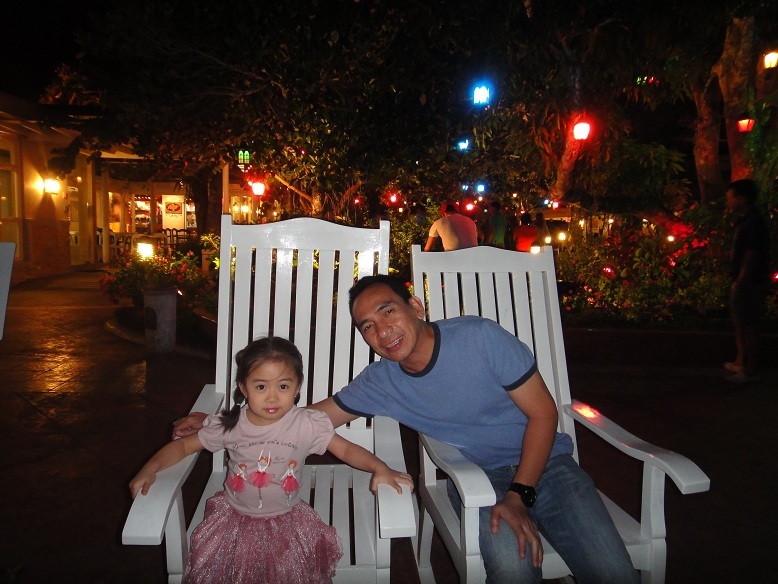 And now I keep on hinting we should spend his birthday in Tagaytay… Konti nalang bibigay na. Thanks mar! yes it was a great weekend!